(Lanka e News - 20.Feb.2019, 11.30PM) President Maithripala Sirisena and senior members of the opposition including former President Mahinda Rajapaksa have harshly criticized the Constitutional Council and the Human Rights Commission. Their accusations range from failing to favourably consider the President’s nominations to the judiciary, to causing the collapse of public administration, to putting obstacles in the path of the government’s campaign to root out criminal activities and the narcotics trade and to even being culpable for the death of Sri Lankan soldiers on a peacekeeping mission. 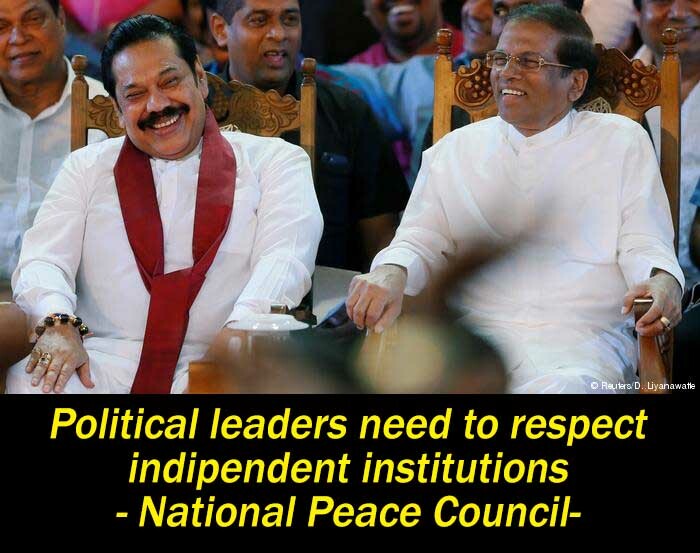 The National Peace Council is concerned that the unreasonableness of these criticisms erodes the commitment to basic principles of good governance. Underlying these criticisms is likely to be the frustration of elected politicians that their power is being restricted and their political goals and personal whims and fancies do not prevail. The Constitutional Council is primarily aimed at depoliticizing the state and public service and ensuring the Rule of Law prevails. In their original formulation in the 17th Amendment the setting up of these institutions was approved without dissent by parliament, which included those leaders who now denounce it. The independent commissions whose members they appoint are meant to restrict the power of politicians to interfere into the judiciary, police, elections commission, and investigations into bribery and corruption to mention some of them. The background to the establishment of the Constitutional Council and the independent commissions in 2000 was the negative experiences of abuse of power by successive government leaders and the need to set up a system of checks and balances to curb that power. This was reaffirmed by the 19th Amendment which was passed in 2015 with President Sirisena playing a leading role and thereafter justly claiming credit for this vindication of good governance. In particular, the Human Rights Commission and Police Commission, play a crucial role in protecting the citizens from the arbitrary actions of the state and to ensure that it acts in an enlightened manner. Their independence from the government needs be respected. The National Peace Council calls on our political leaders to appreciate the work of the Constitutional Council and independent commissions without trying to reverse the good governance gains they have brought to the country. We call on the President and all political leaders of our country, to ensure that an enabling environment be provided to independent commissions like the Human Rights Commission to perform their duties without undue political interference. We believe that the President and government are duty bound to support and respect the independence of such institutions, which must be explicit in their words and actions.